Consulting can be a thrilling, wealth-building career. It should be. If you’re in the consulting business for keeps—particularly if you’ve taken on the risk of independent consulting in a boutique or solo shop—then the reward should be sky-high job satisfaction and a burgeoning bank account. If that’s not where you find yourself, I’m about to show you why and offer directions to the promised land. Let’s talk about fun and money. First up: rollicking, frolicking, whoop-and-holler fun. Oh yeah, this is professional. 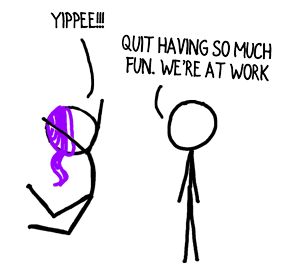 Let’s talk about days-flying-by, can’t-wait-to-jump-in, sense-of-pride-and-accomplishment joy in your consulting work. When your work aligns with your innate genius. Your innate genius is where you, as an individual and a firm feel like work is play. Thought leadership flows from you effortlessly. Time spent gaining experience is a pleasure, not drudgery. Your high score at Minesweeper remains untested because daily tasks engross you and are easy. You attract like minds who enjoy untangling the same analytical or human riddles. Got it, now let’s talk about money. Where are the rich oil fields in the consulting profession? Wherever there’s an urgent, unsolved client need. Information Technology has been a bubbling, frothing geyser of consulting opportunity for years because new, innovative computer systems increasingly pervade every aspect of life and business while we’re still befuddled by three year-old smartphones. Cool, let’s model innate genius and market need. Grounded – Consultants and boutique firms that are grounded are struggling, at best, and not enjoying their time in the profession. Individuals look for unlocked doors back into the corporate workforce; firms teeter and collapse. If you’re here, close shop, get a corporate job, join a thriving firm, or prepare yourself for wholesale change. Puddle Jumping – A practice built around a personal interest rather than a market need never flies high or far. Consulting engagement are occasional, short hops. Rainmaking is a brutal struggle and rarely expands beyond the founder. I’ve seen boutique firms reach low seven-figures if they’re on the fringes of a market need, but rarely grow past that. Solo puddle jumpers scratch and scrape to collect low six-figures. It’s exhausting. To upgrade your flight path you have to let go of your definition of what you do. Resist starting from what you love, what you’re good at and what you’ve done in the past. Develop a perfect offering, conduct the “Problemeter” exercise (explained in this book), and ruthlessly point your consulting firm toward a market need. 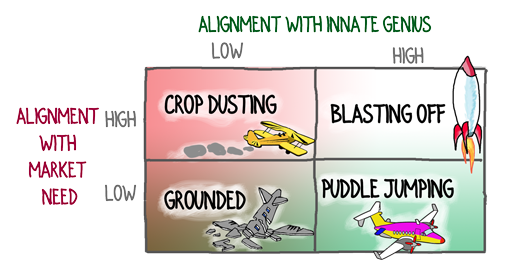 Crop Dusting – Gratefully accepting any available engagements results in dreary, grueling, unsatisfying, low-margin work. Many consultants either can’t find or have ignored their innate genius. If you’re on this flight path, you’ll tackle any project that pays. I often see extremely bright, alumnae of big-name consulting houses on this path. These consultants engage—often through a broker—in projects that leverage their big brains, but not their innate genius. For boutiques, incorrect expansion strategies blur their focus and lead to more commoditized work, compressed margins and bored staff. The fix here is two parts: 1) find (or reconnect with) your innate genius while continuing to listen to the market; 2) learn to say “No” to projects that are not aligned with your innate genius. Blasting Off – Where innate genius meets market need, the sky’s the limit. This is where consulting is fun and lucrative. Where sustainable, scalable practices are found. Independent consultants who are blasting off, connect their innate genius with market needs. It’s where the love of exploring novel, intellectual territory intersects with manufacturers’ need to enter new markets. It’s where the joy of enabling others’ career progress intersects with large companies’ desperate desire for a better coaching approach. It’s where the intuitive analysis of complex financial records intersects with conglomerate’s desire to capture profit after a complex acquisition. All of those intersections represent firms that are blasting off because they’ve married their innate genius to a focused, burning, pervasive market need. What about you? How can you connect your innate genius to market needs? And here I thought the answer to “Where Consulting is More Fun” was the Caribbean. But I digress. While I agree with much of this excellent blog post (another winner David! ), in my experience there are tradeoffs in the “Market Need” area. Aiming for a large “Market Need” might not be the best way to stand out. I’ve found that aligning my skills and abilities (25+ years of branding experience) with a niche market need (name development) has led to a significant business that hardly feels like work to me. In the end, this blog post is correct, but you have to be careful about defining the “Market Need.” Don’t aim for a huge market…it is way better to find a niche where your “innate genius” is especially relevant. Mark, I completely agree. You could argue that 100% of companies “need” more profit, but you couldn’t build a successful consulting firm on that need. 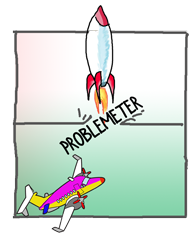 That’s why the Problemeter exercise focuses on specific problems/symptoms, and that’s why I encourage firms to develop a Fishing Line with a tightly defined, narrow target and a precise problem. There’s nothing wrong with a pervasive market need, but there’s definitely a downside to a vague one. The focus of most of my work (and my innate genius, if I have one!) is in doing the delicate work of developing top leaders and their teams. Is this a crowded space in the consulting field? Absolutely! But that’s because a) organisations have a big need for help in this area for which many of them are b) willing to pay. So why wouldn’t I play where market need and innate genius are aligned? Well, believing that I needed to differentiate myself from others in this crowded field, I looked for ways of presenting myself as something other than a leadership development consultant while actually wanting clients to give me leadership development work. Bonkers! So I’m learning to relax into describing myself as a consultant focused on leadership development. There are still things which differentiate me from others, and prospective clients discover this when they talk to me. But the conversation typically starts when they are looking for someone to help them with leadership development – they discover what’s different about me after that. You’ve provided a fabulous case study, Stuart. Congratulations on “relaxing into” describing yourself as what you are. As you pointed out, the deep connections and discoveries that emerge in subsequent conversation with prospects allow you to become the obvious choice. Thank you for providing your perspective. Fast-forward past my MBA, CPA, and other hard-earned alphabet soup, I now understand why I get paid for what I do…but the joy, the joy is still there. Putting the “Fun” in Chief “Fun”ancial Officer. Jaime, all I can say is I’m glad you didn’t choose to pursue a mortuary career, because putting the “fun” in funerals might not have worked out quite as well! Seriously, you’re a great role model for many.